On Monday, April 3, 2017, Lion's Roar: Buddhist Wisdom for Our Time posted "Stand Against Suffering: An Unprecedented Call to Action by Buddhist Teachers," a call for Buddhists and all people of faith to hear the cries of a suffering world and respond with wisdom and love. This powerful document was signed by 13 leading Buddhist teachers from a range of traditions joined by more than 100 additional signatories. So many strong hearts, voices, and minds joined in unison — Jack Kornfield, Joan Halifax, Sylvia Boorstein, Norman Fischer, Joseph Goldstein, Tara Brach, Bernie Glassman, Natalie Goldberg, Robert Thurman, Lama Surya Das, to name a few from our Living Spiritual Teachers Project — to speak on behalf of "the cries of millions who will suffer from regressive policies of the new U.S. administration targetting our most vulnerable communities" and "the cries of a nation whose democracy and social fabric are at risk." We are grateful for this courageous Buddhist leadership, inspiring us to be fully conscious of our own responsibilities. 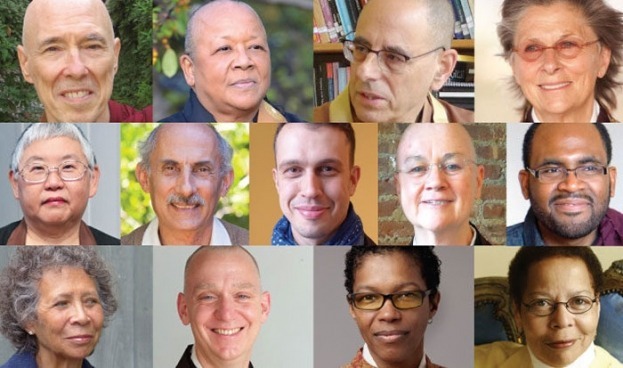 our courage rekindled by the courageous stance taken by American Buddhist leaders. May we be strengthened to work for a more just and caring society. May we join together to find creative and genuinely helpful ways to resist policies that cause harm to the people, creatures, plants, waters, earth, and atmosphere of this beloved planet. May we not lose hope, but instead continually reinspire each other, knowing how to be both vigilant and resilient. May we examine our deepest beliefs and live them wholeheartedly. May we shift the tide towards love and respect, patient in the face of setbacks, clear when confronted with attempts to confuse, protective towards those facing trouble, brave in addressing our own ignorance. May we each recognize our own distinct contribution and how it fits into the whole. As the call states, "Some manifestations of Kwan Yin [the embodiment of Compassion] have a thousand arms because there are many ways to serve others." O You who hold the whole arc of history in your mind, may we live in such a way that people many generations from now will remember this as a time when kindness prevailed.